I’ve had two heroes in my life. My Grampa was the first. And he introduced me to the second. In early October 1980, when I was ten years old, I was a collector of baseball cards. It consumed me. After school my friends and I would trade them, sparring like gladiators playing a game of “Go Fish!” to the death. “I’m not trading a ’75 Pete Rose for a no-named pitcher from Cleveland! Are you out of your tree?” My friend Jimmy would scream at me. I had boxes of cards. I also had little-to-no knowledge of who the players were. By placing them in alphabetical order, I thought I was collecting correctly. Baseball Bingo. Once I had a card in every letter I figured I’d win. By the end of October I’d completed every one of my chores and racked up $15.00 for the month. As a reward, my Grampa and I had a “Boys’ Day” out: just the two of us. Time with Grampa usually meant a chocolate Concrete at Ted Drewes, followed by a long walk down an old, abandoned line of railroad tracks where I’d try (always unsuccessfully) to run along the metal rails without falling. This particular “Boys’ Day” came with a bonus: A baseball card convention. Not only had I never been to one, I didn’t even know they existed. I remember walking through the doors of the convention and feeling as if I’d just stepped into Willy Wonka’s Chocolate Factory. Except the candy had been replaced with endless booths of perfectly aligned little pieces of cardboard with pictures of baseball players from every decade. Rows of caps from every team, even ones no longer in existence, hung over my head…just out of reach. Baseball bats and colorful uniforms blended perfectly with the smell of fresh leather. And the “popping” sounds of baseballs being snapped into the webbing of the gloves made for a gorgeous echo throughout the hall. Grabbing me by the shoulders, he ushered me into the back of the line. “Here. Take this ball. I’ll wait for you over there.” Standing with the multitude, my head no higher than their waste line, I nervously gripped my baseball while listening to the chatter of those around me talking in glorified unison about a man I didn’t know. An hour later, I climbed the stage and made my way to this…this, “Man.” “Whaddaya Say?” The strange grown-up said to me with a big smile. “I say…hey?” I shot back in the form of question. “No, that’s Willie Mays. He’s the, ‘Say, Hey Kid.’ I’m Stan.” He laughed as he took my baseball and scribbled his name between the stitching. We talked for just a minute but it seemed like hours. On the way home, Grampa peppered me with questions about my encounter, and what I thought of this newly discovered baseball icon. Nearly home, I realized I had left my jacket at the convention. Grampa turned the car around and drove the forty-five minutes back to the hotel. Not a grunt. Not a groan. He never stopped smiling. We pulled into the parking lot, the convention long since over. Grampa kept the car running while I jumped out to search for my coat. Closing the car door I noticed a small group of people huddled just outside the lobby. In the middle of the pack was Stan “The Man.” He was still there. Still signing autographs. Still posing for pictures and still talking to everyone. I found my jacket bundled up in a nearby corner of the darkened convention hall and made my way back to the car. The janitor, who was sweeping up, found it and placed it there for safekeeping. Just in case its owner came back. Making my way past the cluster of folks, I heard a familiar voice. “Would you like an autograph, son?” I stopped and looked up into the eyes of Stan Musial. “You already gave me one. See. Just here.” I said, holding the baseball up for him to see. “Well, how ‘bout this.” Turning, he grabbed a piece of yellowish paper from a small table behind him, then scribbled his name in blue Sharpie and handed it to me. “That ‘yer Grampa over there?” He asked, pointing to the car in the parking lot. “Yes, sir!” I replied. The two exchanged waves. “You give him this for me.” He said, with a wink. It was like talking to God. As time went on I studied the game, and even more about the players. By the time I reached High School I knew more about Stan Musial’s batting statistics and fielding percentages than I knew of my trig and calculus classes. It was only because my tutor collected baseball cards and weaved that knowledge into a paralleled world of math for me, that I was even able to pass those classes – with a “C” – but still. When Grampa passed away, I thought of the times we shared together. He was the best man at my wedding. He taught me how to shave and how to drive a car. But it was the day he introduced me to Stan Musial I remember most of all. Stan “The Man” died yesterday at the age of 92. He played his entire 22-year career with the Cardinals: unheard of today. So what if this Hall of Famer could bat over .300 by swinging a butter knife? It wasn’t his play on the field that made him my hero. It was the graciousness he displayed off it. Stan Musial played in over 3,000 baseball games and was ejected the same number of times he declined to give an autograph to a fan. Zero. Both my heroes may have passed away, but they passed on something more important: an indelible impression on my life. 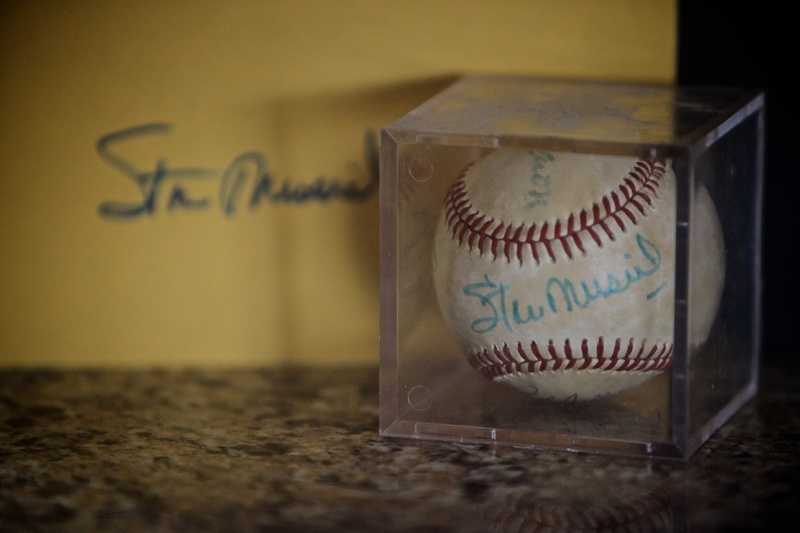 Everyone who ever met Stan Musial will tell you they felt as if they knew him. And that’s because they did. I’m glad I got to meet him. And I’ll remember forever, that one moment where my two heroes had a moment of their own: a casual wave that meant as much to Stan Musial as it did to my Grampa. I’ve always been skittish of those who beg for money on street corners. “Don’t make eye contact … maybe this vagrant will go away,” I’d say to myself. Keeping my windows up, I’d lock the doors, and hope for the light to change. “Where do you live, anyway?” I’d say under my breath, more of a comment then a question. Slowly, despondently, the man would pass by my locked fortress. I’d lift the phone to my ear, pretending to be on a call. Dehumanize them in my mind, and I don’t have to care. Recently, I caught a green light and passed a homeless man at breakneck speed. As he got smaller in my rearview mirror, something clicked. I paused, and began to think about where he really might live. “What if he lived inside his own locked fortress?” I thought. Not on a street, but in a car? And what if he wasn’t alone? What if he had a family in there with him? “There’s this thing called NIMBY-ism,” Brent Trotter, president of the Coalition for the Homeless of Central Florida, told me. “It means ‘not in my back yard. '” The problem is, it’s already there — a Third World emerging right under our noses. And even when we see it, we don’t recognize it. “You don’t recognize it, because homeless people look just like you and me,” Trotter said. Not recognize it? Surely, Trotter was mistaken. And looking “just like you and me?” Was that some sort of joke? I don’t look like a homeless person — I look, well … I look, normal. Most of us are just two paychecks away from being homeless. It’s an alarming statistic. Even more disconcerting, according to theU.S. Census Bureau, is the poverty level for a family of four has dropped to just above $22,000 a year. Homelessness is not only a prevalent problem in our country, but a real issue in our own community. In Seminole County last year, the recession forced Jennifer and her son, 9-year-old Christopher, to move into their car. Driving from lot to lot, they would sleep in the seats of their cramped, 2003 Ford Focus. Christopher sprawled in the back with a blanket that used to fit his bed. Jennifer stayed in front, keeping watch throughout the night. She cranked the car’s engine for heat, using gas that cost money she didn’t have. The trunk became their closet, the glove box their drawer. They brushed their teeth in Walmart bathrooms and took showers in the storeroom of a local business owned by a friend. They sneaked in before the store opened — embarrassed to be living out front. While Jennifer worked, Christopher spent the day alongside classmates who never knew there was anything wrong. Homework took place at the public library, dinner at a fast-food restaurant, then back to the parking lot: “home” for the night. Their clothes were never dingy. Jennifer didn’t push shopping carts along sidewalks, and the Nikes Christopher wore were purchased at a thrift store. They didn’t look like typical homeless, because there’s nothing typical about it. Throwing change into the Salvation Army kettle is but a drop in the bucket. Though the holidays are over, the destitute are still out there. Homelessness isn’t a seasonal problem. And homeless people are just that: people. Trotter issued a challenge: Run toward that which disturbs me. And while I may not be running at an all-out sprint, I am moving in that direction. I realize now, not only has the face of homelessness changed; it’s becoming all too common. And it’s not just about giving change — it’s about changing the way I perceive homelessness and those who endure it. It starts with one person — one person changing his mind, so his heart can follow. I changed my mind about what homelessness looks like, and that has changed the heart of the matter for me. I’m hopeful others will follow.